Consistency is all football fans ask for. If the referee whistles for the slightest of contacts as fouls, then whistle for both teams. If a player finds some good form, score against every team, not just the weaker ones. And if a manager chastises his players for something, give equal criticism to every player who commits the same mistake. Consistency is a desirable trait. For Maurizio Sarri though, his lack of consistency in the past two weeks could save him his job. For months, Chelsea fans have screamed for Sarri’s head, mocked him with chants from the stands, and pushed for him to get the sack mainly due to his predictability and flat, lifeless performances from the squad. A 6-0 thrashing against Manchester City. A collapse at Bournemouth which resulted in the blues conceded four goals in the second half and a lackluster 2-0 defeat at Goodison Park are just some of the uninspiring results that have enraged supporters. All of these matches saw Gonzalo Higuain as a number 9 flanked by Pedro on the right and either Ross Barkley or Mateo Kovacic in midfield supporting the manager’s favorite Jorginho. Every one of these players has been jeered by fans either in person or on social media for their sub-par displays. By maintaining roughly the same XI, Sarri appeared stubborn, unwilling to change his system and reluctant to change the players involved. The Italian simply blamed them for not understanding his system instead of accepting onus and giving others a chance to prove themselves and earn a starting role. But then something happened against Brighton recently. Sarri finally made changes everyone asked for. He started Callum Hudson Odoi up front with Eden Hazard and Olivier Giroud. The youngster set up a goal and both the World Cup semifinalist and World Cup winner scored. Ruben Loftus Cheek also started and made his mark on the game from midfield. Throughout most of the season, this rotation would’ve been a one-off for Sarri and a subsequent return of the rested players. Surprisingly that didn’t happen this time. The Italian started both Loftus Cheek and Hudson Odoi again against West Ham the following week, only this time with Higuain as the number nine. Chelsea won a second consecutive Premier League game and both youngsters and the team in general performed well. As the Liverpool match approached, it seemed as though Sarri would continue this new XI as neither young player started n the Europa League game at Prague. The former Napoli coach, did in fact, start both at Anfield but used Hazard as a false 9, a role the talisman dreads. It may not have succeeded as swimmingly as he or the Chelsea fans would have hoped, but it was the right move. Has Giroud proven he deserves to start week in week out? No. Has Higuain shown he’s the best number 9 in the squad? Also no. Does Hazard usually play well as a false 9? No. The fact that Sarri is searching to find the best fit is significant progress and welcomed change to his earlier season bullheadedness. Consistency for most managers is a good thing, but over-reliance on one formation or player causes problems and leads to predictability. 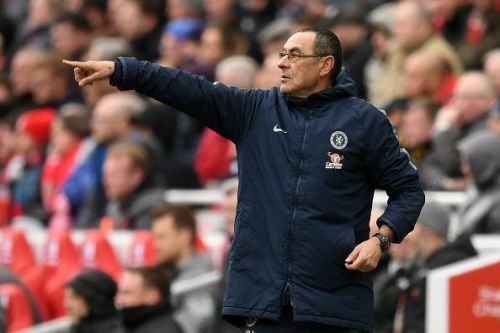 That was Maurizio Sarri and Chelsea's problem earlier this season which caused the consternation of fans and appeals for his sacking. In the past few matches, the former Napoli boss has shown he’s willing to try something different, to rotate and search for another best XI. It may not work every game, but Chelsea fans should appreciate him putting aside his pride or finally realizing the shortcomings of the team. Sarri’s lack of consistency and adaptation of late means he should keep his job after this year. Will he? It’s hard to tell. Will Chelsea fans want him? It seems unlikely as Loftus Cheek and Hudson Odoi starting have only put the fans’ ire on hold. It should, however, quash their outrage and get them to rally them behind the manager. Sarri deserves the support of the fans and the players right now. The 60-year-old's recent consistent inconsistency is just what he and Chelsea need. Premier League 2018-19: Is Maurizio Sarri the right man for Chelsea from a long-term perspective?